The title of this post is somewhat misleading...Because I feel quite fortunate not only today but most everyday. I will reveal something to you at this very moment. I am the girl who goes through all of your Facebook photos peering into the most intimate details of your life. I examine your life comparing it to my own. I wonder what it would be like to wake up in your bed. I wonder what it would be like to feed your children their cereal each morning. I wonder what it would be like to sit through your office party. I wonder what it would be like at your neighbor's house on a Saturday afternoon mid-July. I wonder and wonder. I sometimes lose myself for HOURS in your photos - and then, I am grateful. I am grateful that your life is yours and my life is mine. Tonight, I did not even have to psychologically visit another person's life in order to appreciate my own. 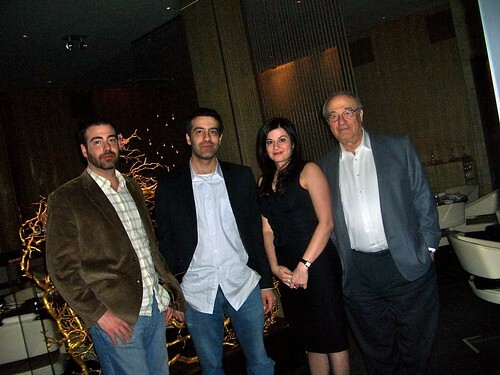 Tonight, I celebrated my 38th birthday with my father and my brothers. This year for my birthday I asked my father if we could skip the gifts and all enjoy a fantastic dinner together. He agreed. We had dinner at L2O on Friday night. My father, my brothers, and I, we all love to dine. I remember being very small, maybe 7 years old, and my father would buy escargot from a market and make it for his dinner guests. I was eating duck liver pate when I was about 10 years old. But as much as my father loves to dine, he is not much of a "fine diner". I realize that most people consider a good steak to be "fine dining" but I am not talking about that. I am thinking more along the lines of Haute Cuisine. I must admit, I was a bit nervous that my brothers and father would not enjoy the meal. In fact, I was nervous that I would not like the restaurant or perhaps not enjoy the meal as I was not that familiar with L2O prior to dining. But that was not at all the case, the restaurant was beautiful, just my style, and the meal was excellent. The highlight was the service. Young, fresh and extremely knowledgeable staff. The restaurant is decorated in a minimalist style. There are light wood paneled walls with dark cherry tabletops. The seating is mostly leather, brown and cream colored chairs and some tables have larger banquettes. When we were seated at our table, teaspoons and a fork were resting on white alabaster settings. We started with a glass of champagne, I had a glass of the Duval Leroy Rose, while we looked over the menu. We decided that the four course would be sufficient but you have the option of selecting 6, 10 or 12 courses. I started with the madai as my "cold" dish. 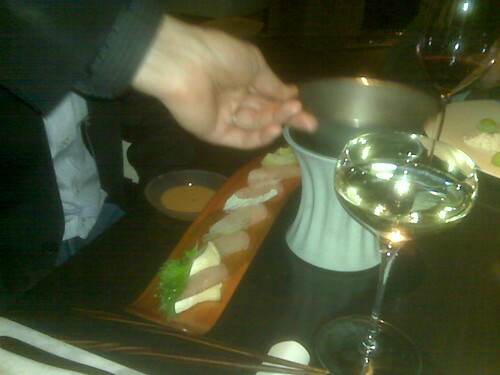 The fish was cut into one centimeter cubes and it was served in a yuzu (citrus-y) sauce. 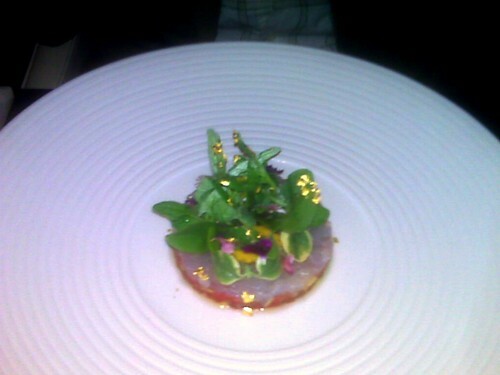 My brother had the tuna with tomato with foie gras "snow" (basically freeze dried foie gras). My father had peeky toe crab with keffir lime oil. We all enjoyed our dishes so much, we did not even offer one another a taste of our dish! In fact, I warned them to back off my madai. Next up, our warm appetizers paired with fantastic wines. 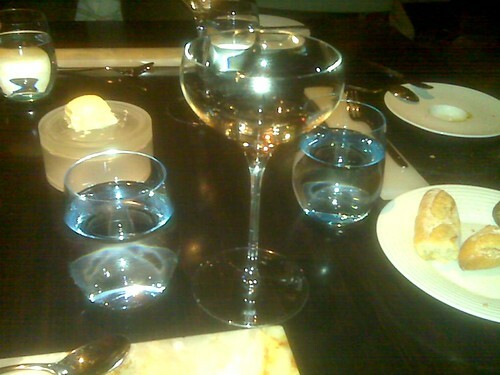 I had a glass of the Francoise Chidaine Chenin Blanc, it was my favorite wine of the night. My dish was the seared foie gras with raspberry and flakey, filo dough. One brother had the scallops, my other brother had the lamb tartare with pickled mango (yes, you read it right, raw lamb) and my father had the lobster bisque. Our main courses were on their way and my father was ready for his glass of red wine. Our sommelier had paired his dish with a fantastic glass of rose - Rose Charles Audoin, a Pinot Noir rose, but my dad decided to go with a "real red." Make no mistake, I ensured that glass of rose did not go to waste. 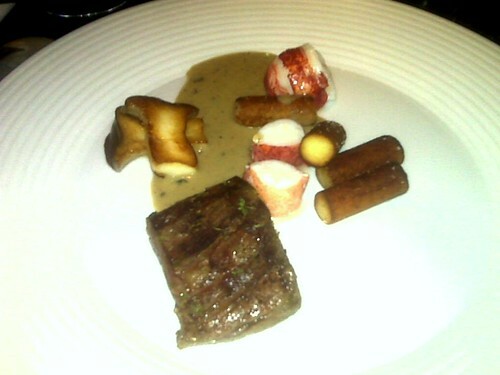 For my main course, I had the Wagyu Beef (those fancy, massaged, Japanese cows that are raised to become the most delicious steaks) with Lobster, mushrooms, potatoes and truffle emulsion. I thought the potatoes and mushrooms were a great addition to this dish. My dad had the Striped Bass, my one brother had the Steelhead Salmon and my other brother ordered my second choice, the Shabu Shabu. Shabu Shabu was raw fish on a long plate that my brother dipped into a broth to lightly cook the fish. Dessert was nice but did not compare to the first three dishes. 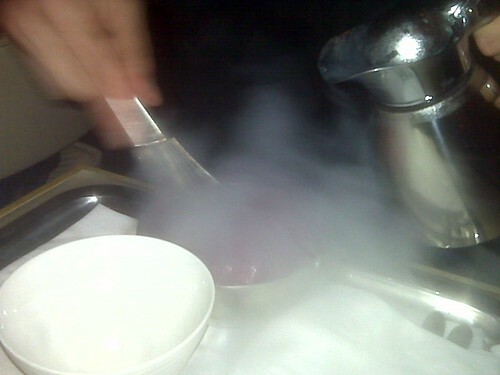 I had something with a berry-like sorbet-ish thing. My father's dessert was much better, he had a souffle. My two brothers opted for the cheese course -- most certainly the winning choice! Dinner took about three hours in total but we all agreed that we had an incredibly fantastic time. I was so pleased to be able to enjoy such a "civilized" night with my brother and my dad without boyfriends, girlfriends or interruptions of any sort. My family birthday dinner was a huge treat for me, not only because the food was incredible but because the entire experience was fantastic. Given the opportunity, I would most certainly head back to L2O. My father put it most simply, "This is not food, this is art!" I wish people would take more opportunities to share a truly fine meal with people they love. In my community, I'm sure most everyone has never had such an experience. It's expensive to take the people you love to some exotic location -- perhaps to see a volcano in Hawaii, or to witness a solar eclipse in India -- but one excellent fine dining experience with the family each year is surely within the means of most Americans... and a few Canadians... and like 15 British people. You are more than welcome to experience breakfast at my house...quite the adventure. I loved this post. Thanks for letting us all peer a little bit more into your life. After rereading what I sent before, I have considered that perhaps my opinion of what is a fine meal is probably different from someone else's. Perhaps I should have said that it's awesome that you took the time to do something with your family that you all enjoy so much. I want to make a joke about drinking beer from glass bottles instead of metal cans, but I think that would be inappropriate. I like saying "metal cans" and when I so, I hear David Byrne in my head from the song Mr. Jones.